Welcome to a new series on Rated NA: We Need to Talk. 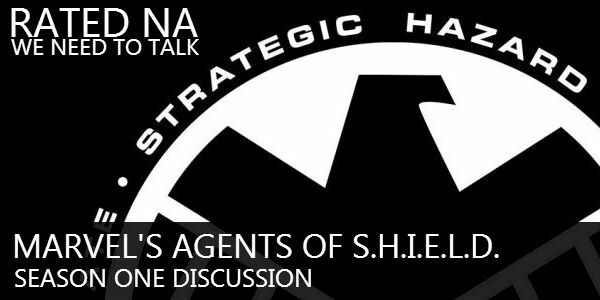 We set aside an entire bonus episode to chat to talk about our feels for the first season of Marvel’s Agents of S.H.I.E.L.D. Plenty of spoilers ahead as we talk about season one, and make predictions for season two! Let us know what you think! I’ve only listened to part of this discussion, but I wanted to post something right now. The writers certainly had their hands tied by not being able to reveal certain things on the show until Winter Soldier came out, but I am not as dismissive of the first half/two-thirds of the season as many other people have been. I liked getting to know and like the characters before the big reveals happened. I really think that the tv airing schedule was the bigger problem since there were so many breaks (and some long ones!) between new eps. I think the powers that be used those early episodes well – setting things up that would all come together for the last 7 episodes. Except for Fzzt (ep 6) – which was a tie-in to The Avengers (the Chatauri helmet) and Repairs (ep. 9) – a little backstory on The Cavalry – all of the earlier episodes tie into the end of the season in some way. I agree! I totally forgot how messed up the schedule was due the Olympics this year. I hope we didn’t come across as negative, I think all of us really do love the show. Just to jump in with Ash, I totally agree too! Sometimes I think we are the hardest on the ones we love but this show went from being sort of monster of the week to clearly jumping into deeper back story in relatively short order. I mean the “villain” for episode one ended up being one of the more awesome characters long run in the series. (J August Richards). I had completely forgotten as well about the olympics and like we said, they clearly had to wait for Cap to accelerate the series to full throttle, but I’m super excited about season 2. Rated NA 153: Let’s Quip!